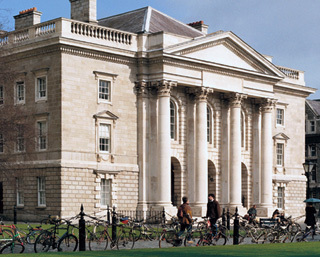 Trinity Development & Alumni, administered from the offices of Trinity Foundation, is responsible for supporting Trinity’s ambitious educational, research and outreach programmes and maintaining a connection between the University and its alumni & friends. Trinity College Dublin is playing a pivotal role in helping Ireland to be the most creative and productive place to invent, work, and learn, and to contribute to local and global society. Trinity Development & Alumni plays a vital role in ensuring that the University has the financial resources to remain a leading, internationally recognised university. Trinity Development & Alumni helps the University to achieve its mission through the extraordinary support of donors, alumni and friends. Trinity Development & Alumni also keeps alumni connected to the University through regular communications, events, regional branches and affinity groups. Alumni simply means graduates or former students of Trinity. Your alumni connection is for life and With over 100,000 Trinity alumni scattered across the globe, there is a tremendous resource for networking and staying in touch with people who have shared the Trinity experience. Learn more about the benefits, services and networks available. Should you have any questions or queries see our FAQ’s or contact us for more information. There are hundreds of good reasons to give to Trinity, browse the different ways you can support trinity or contact a member of our team to learn more. *Trinity Foundation was established as an independent charity (CHY10898) in 1994 to support Trinity’s funding priorities. Since 1994 the Trinity Foundation has been instrumental in raising funds in excess of €280 million.